We originally booked our trip for Dublin and London, but nothing outside of the cities. This was quite, silly since we spent much of our amazing (but very inexpensive) honeymoon driving across the countryside of Ireland years ago. Thankfully a friend pushed us to take a day trip from Dublin into the Irish countryside. I swapped one of our planned Dublin days for time in County Wicklow. 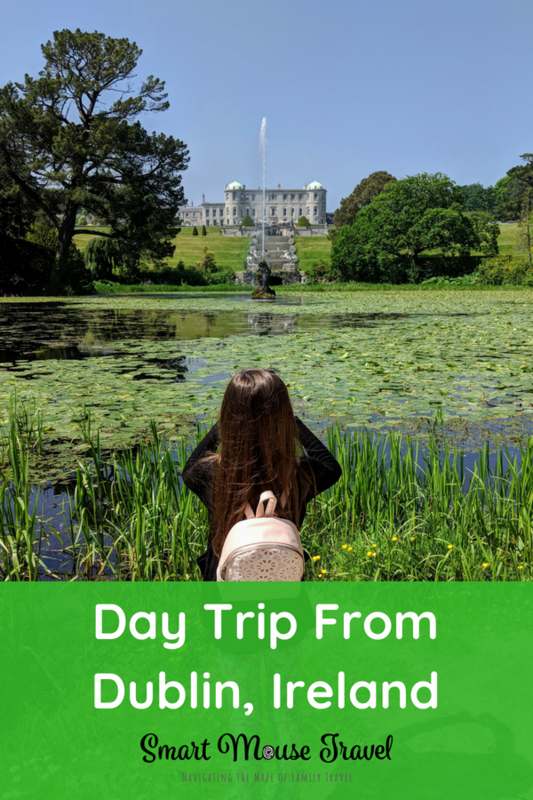 This day trip from Dublin into County Wicklow, Ireland was some of the most fun of our entire trip (second only to our Harry Potter Studio Tour in London). 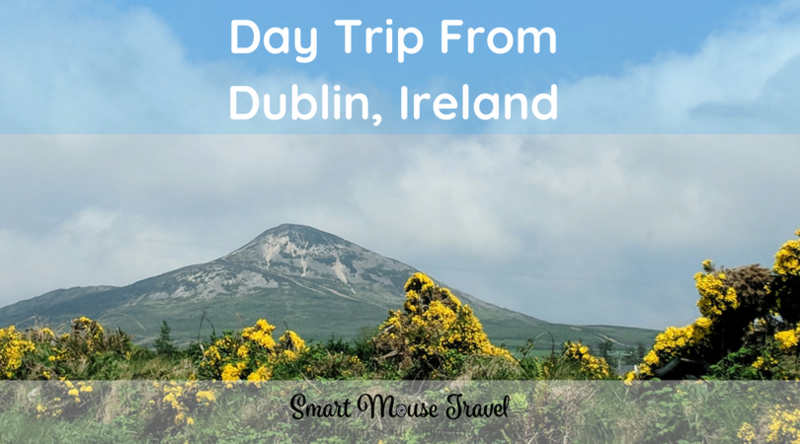 Adding a day trip from Dublin into the Irish countryside was a late change in our plans. The only way to visit was to drive into the country immediately after arriving in Dublin. We were incredibly tired from our overnight flight, but renting a car at the Dublin airport and taking the 45-minute drive was quite easy. Please note: You drive on the left in Ireland. And the roads are incredibly narrow. So maybe it was an easier 45-minute drive for me and a little less easy for Mr. Smart Mouse who was actually driving. 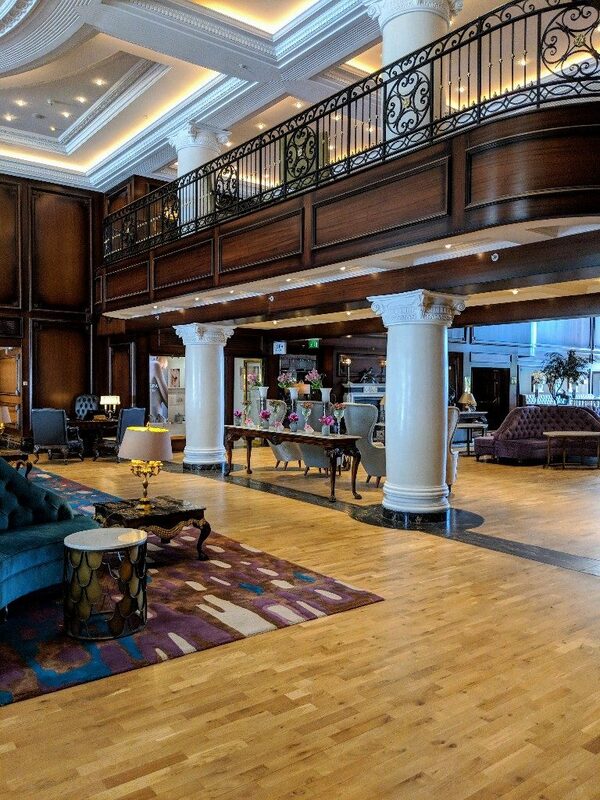 We stayed at Powerscourt Hotel, which is part of the Autograph Hotel group. The moment we walked in we were greeted by a enthusiastic hello, a beautiful lobby, and the smell of fresh flowers. Our room was ready even before check-in time. Our spacious suite tried to entice us to take a nap, but we resisted. We did, however, take the opportunity to freshen up. The Classic Family Suite with two queen beds and a sitting area was a luxurious start to our trip without a big-city luxury hotel price tag. In fact, the biggest regret of our entire trip to Dublin and London was that we did not stay at Powerscourt Hotel more than the one night. We chose Powerscourt Hotel so we could drive once and park the car for the rest of the day. It is an easy walk from the hotel to Powerscourt Estate. This sprawling estate is where we spent several hours after arriving in County Wicklow. The Powerscourt Garden is one of the last great aristocratic gardens built in the style of the Versaille or Schönbrunn gardens. There are 47 acres of gardens with several distinct sections. The self-guided audio tour takes you through 1 mile (1.5 km) of walking paths, or you can choose to wander as you please. We opted to explore on our own using the map provided when we entered the gardens. 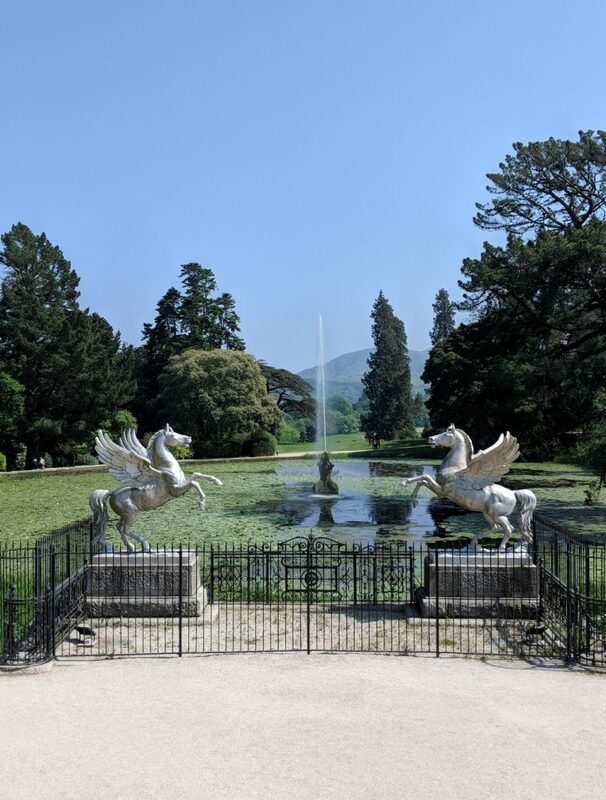 When we first exited the Powerscourt Mansion into the gardens the impressive formal Italian Garden really wowed us. This beautiful garden view inspired us to walk the entire loop through Powerscourt Estate starting with the Pepperpot Tower overlooking Tower Valley. Tower Valley has immense trees, many of which are over 200 years old. The view from the top of the Pepperpot Tower was worth the many, narrow steps up. Next on the walking path was the Japanese Garden. The Japanese Garden has many different paths, cultured flowers beds, and even a little hidden grotto with slowly trickling water and moss on the craggy stones. The less obvious path from the grotto led us down a walkway to Triton Lake, which is part of the Italian Garden we first saw when entering. 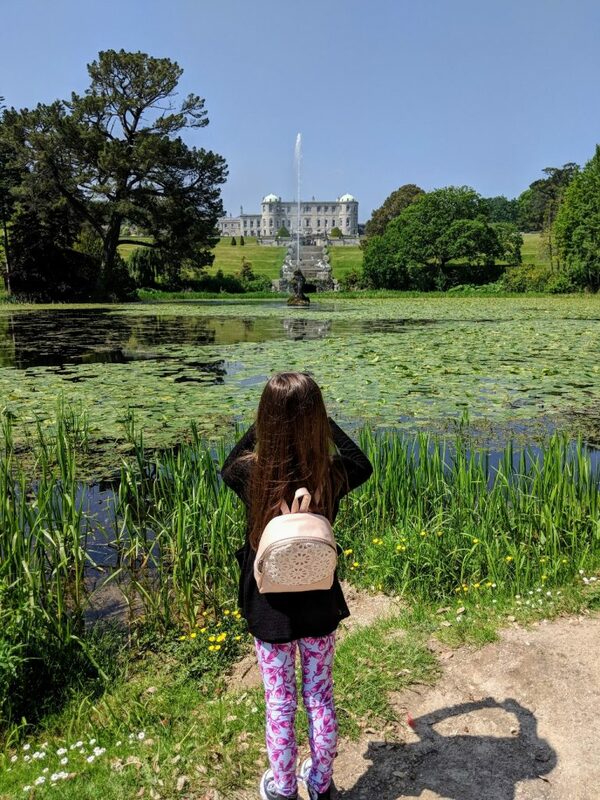 The path behind Triton Lake gives a great photo opportunity of the lake, steps up to the terrace, and the beautiful Powerscourt Estate Mansion. Elizabeth spent a lot of time walking around the Pets’ Cemetery which is located just past Triton Lake. This cemetery hold the remains of beloved pets from the Wingfield and Slazenger families from years past through recent times. Some of the headstones had extremely detailed odes to these special pets. From the Pets’ Cemetery we walked past the Dolphin Pond and into the Walled Gardens. The walled gardens were originally known as the “Kitchen Gardens,” since vegetables and fruit trees were planted here to stock the kitchen. There are also plenty of colorful flowers lining the garden path. Take a moment to stop at Julia’s Memorial to admire the fountain and five busts adorning the fountain wall. Once you leave the Walled Gardens and Julia’s Memorial you will have come full circle to the Powerscourt Mansion. At this point, we took a quick coffee and snack break at the Terrace Cafe overlooking the Italian Garden. Once we had rested and the crowd levels decreased we finally went out to admire the Italian Garden in detail. The Italian Garden has beautiful details, including unique sculptures collected from all over Europe. Our favorite statues were the life-sized winged horses that showcase the beautiful Triton Lake just behind them. We spent about four hours total at Powerscourt Estate before taking the short walk back to our hotel. 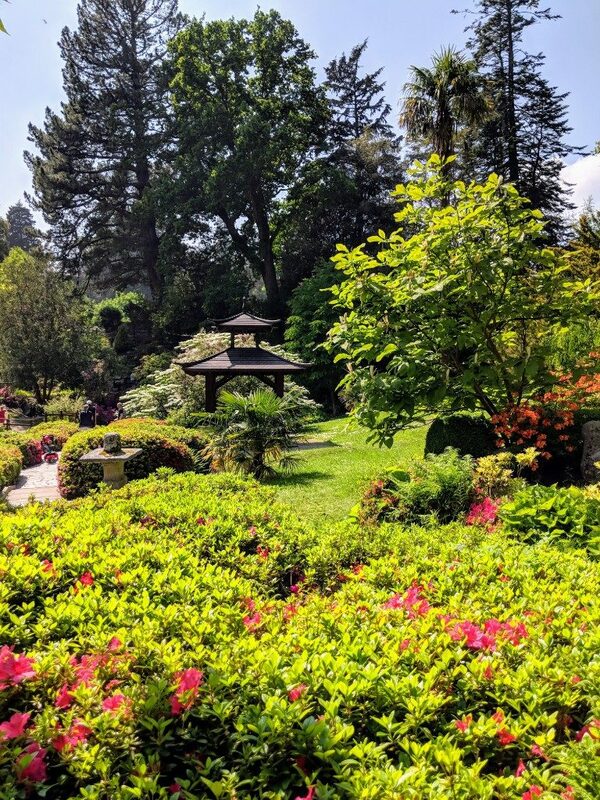 This time at Powerscourt Estate was split between wandering through the Powerscourt Gardens and sitting around enjoying the scenery. If you have the time and energy you can add a stop at Powerscourt Waterfall to your itinerary. Powerscourt Waterfall is a short drive from the gardens and is the highest waterfall in Ireland. The online pictures look lovely, but we were just too tired to go ourselves. 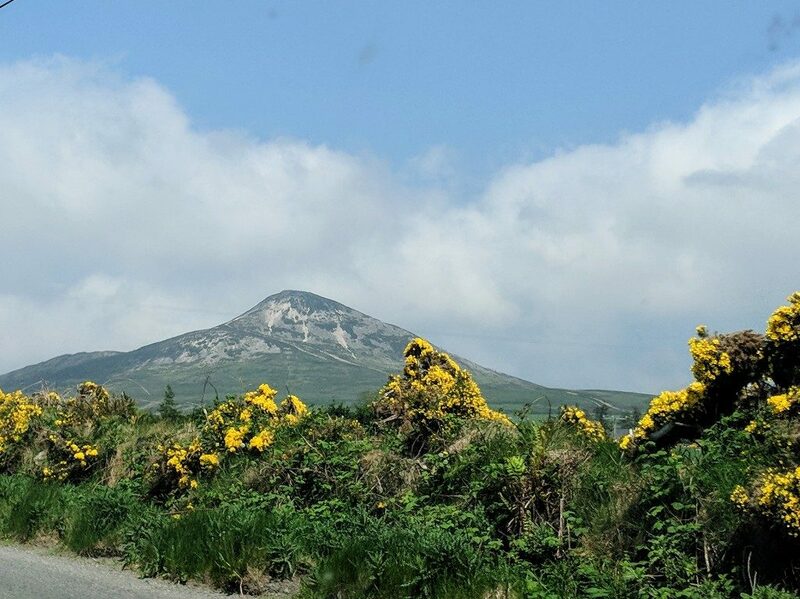 This small town located 18 miles (29 km) from Powerscourt Estate has hiking trails, two lakes, and historic monastic ruins that date back to the 6th century. The visitor’s center has a easy-to-find, free parking lot for our time in Glendalough. Please note this parking lot is a pay lot during busy times of year. Check here for exact pricing and dates. The visitor’s center has public restrooms which you may want to use before you start your hike. The Upper Lake is popular photo spot. Upper Lake is approximately a 1.8-mile (3-km) hike from the visitor’s center with the Monastic Site found just off of this path. The Monastic Site has a large cemetery, several partial buildings and the full tower which you can walk around and explore. We marveled at these churches and monastery homes built so long ago that have withstood attacks from Vikings and time. From the Monastic Site you have two walking paths to the Upper Lake. We opted for the upper path and enjoyed our leisurely hike through the quiet, shaded forest. The hike was easy, and we saw people of all ages, including families with small children, along the path. Unfortunately, I completely forgot our water bottle in the car and regretted it deeply. Please learn from my mistake and bring your water with on your hike! After our time touring Glendalough we were ready for some lunch. A friend had recommended Johnnie Fox’s Pub, which claims to be the highest pub in Ireland. After driving the winding, climbing roads to the pub I can see why it makes that claim. 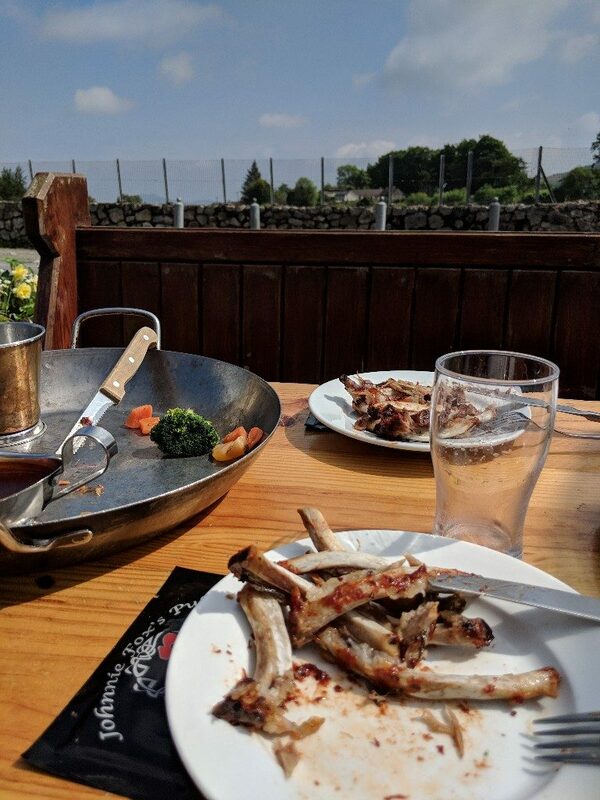 The weather was gorgeous, so we ate our delicious pub food outside of the restaurant. This lunchtime view was lovely, overlooking the Irish countryside. We enjoyed our food, the staff was friendly, and the scenery was fabulous. It was a nice way to recharge after our earlier hike. Parents of young kids who can read may want to be careful about eating inside. The inside pub is full of kitschy signs. Some of the signs are funny for all, and others would have some parents blush if asked to explain them. Please note: There are many options of things to see in County Wicklow. 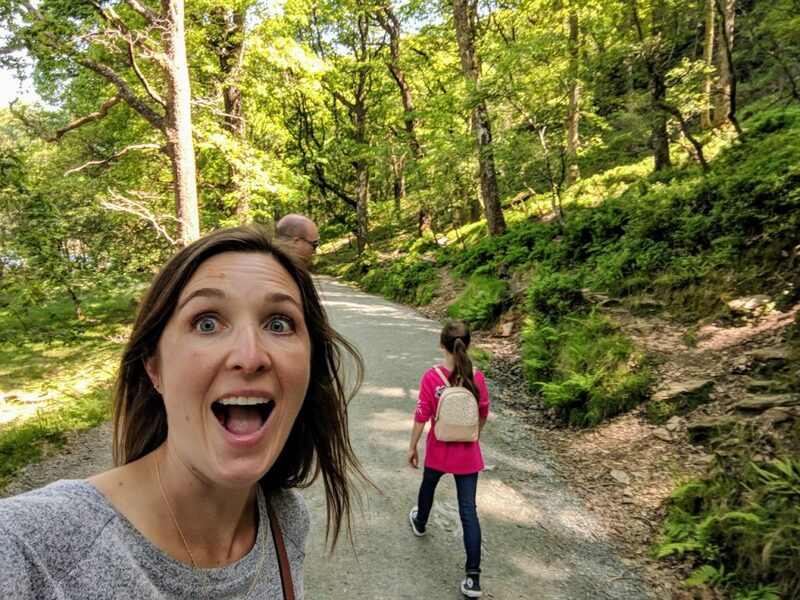 Since we only had our jet-lagged arrival afternoon and the following morning this list comprises the best of County Wicklow based on my research of popular attractions with a focus on ease of driving. 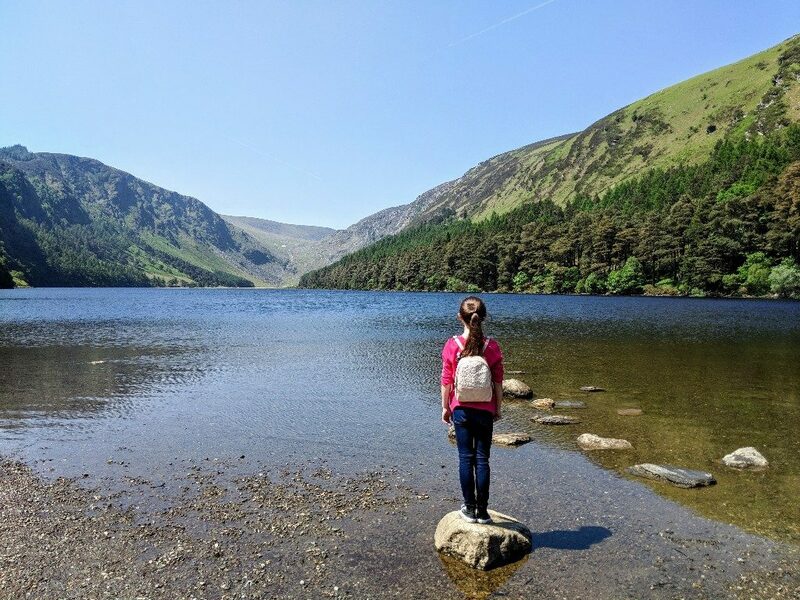 County Wicklow is just a short day trip from Dublin but helps you experience the beautiful Irish countryside. We absolutely loved our stay at Powerscourt Hotel and visiting Powerscourt Estate, Glendalough, and even Johnnie Fox’s. I highly recommend that you take time and make a day trip from Dublin into County Wicklow. Powerscourt and Glendalough were a highlight of our trip. My biggest regret of our trip to Ireland was spending so little time in the Irish countryside. I love the part about the restaurant with the “inapporopriate’ signs. Now that my kids can read, I def avoid those situations! I felt like I needed to share that information 🙂 Thankfully I was able to distract her with funny signs and avoid some of the others!